With complex scientific and technological projects addressing key challenges for humanity (and attracting huge amounts of funding), there is an increasing and legitimate demand from the public for better information and dialogue. 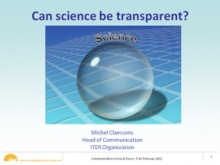 Can science be transparent? The presentation takes ITER (the international fusion reactor being built in the South of France) as an example to show the factors that can promote or obstruct science communication. The presentation features a video - watch it here. In 2004 Japanese national universities became independent administrative institutions and in 2005 the formal introduction of science communication took place in Japan. These two facts led to a new setup of the staff in charge of university public relations and science communications. 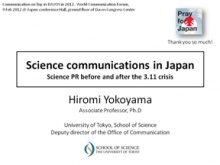 Especially after the 3.11 (Tōhoku earthquake, tsunami and Fukushima Nuclear Accident) universities have been actively required to make an effort to draw public attention to their research outcomes. 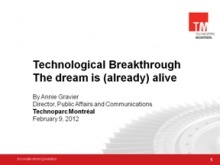 Technoparc Montréal is Canada’s largest science and technology park with 5,000 scientists working in the life sciences, aerospace, ICT and cleantech sectors. Annie reveals its unique working environment and the latest technological breakthroughs to come out of the labs. Take a peek at what awaits the green scientific community: the future Éco-campus Hubert Reeves will be an open, high knowledge site in a wooded setting conducive to the emerging new approach to clean technologies, climate change and renewable energy. Eight smart buildings equipped with most innovative materials and technologies will be linked by water ponds and bike paths with a community garden adjacent to a 26 hectares regional park. The dream is already alive. Supporting entrepreneurs for almost a decade, Maria has seen many examples of really good and bad innovation communication. Most innovators tend to place their main focus on the technique and the innovation itself. However, to be able to develop it further and take it to the market, they need good communication with potential customers and investors. 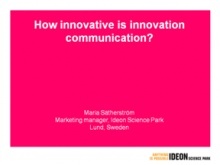 Maria points out some common difficulties in innovation communication and strategies to avoid them. She also views the most important factors in this type of communication. Does it really need to be innovative? In Western Europe there is a shortage on technically skilled people, especially with hands-on experience. In a thriving sector such as the life sciences, this could become a growth limiting step. 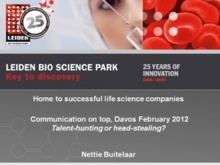 Leiden Bio Science Park, as an ecosystem of companies dedicated to biopharmaceutical drug development, has taken action to prevent this from happening. Several solutions are in place now to ensure the supply of sufficient well-qualified personnel - achieved by carefully building on trust and looking beyond the interests of individual companies. The presentation elaborates on the thus described process and its results. Hans Kunz, Overseas Representative in Switzerland for Hong Kong Science & Technology Park and founding member of the Hong Kong International Coaching Community, tackles the issues of managing large scientific teams, safe-guarding the originality of the authentic technological idea during its implementation, and defending authorship. The presentation aims at helping people understand the need for transparency in a highly competitive environment, focusing on some aspects of the Chinese culture in order to help mobilizing partnerships that will allow you work together and grow. Rohit Bhargava - a marketer, blogger and bestselling author, discusses the rise of content curation and it's impact on marketing and PR, their recent integration, and how we can solve modern believability crisis in communications. 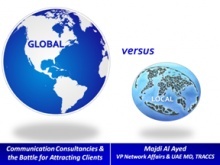 Majdi Al Ayed's presentation provides key strategies and best practicies used in the TRACCS experience as a local consultancy covering the region of Middle East and North Africa. 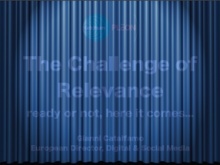 Social Media are past the stage of interesting internet fad and have become a permanent feature of our world. They play to what is perhaps the humankind most ancient desire after food & shelter: the need to communicate with others. 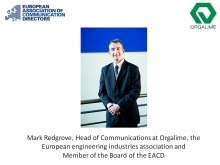 Powered by such a force, they are reshaping all we know in communications and marketing and are radically transforming the way opinions are formed and influenced, prompting an equally radical redesign of the communications and marketing disciplines. Once this is accepted, the obvious question is how we can navigate this redesign without disrupting our mktg & comms activity, and this is precisely what Gianni will briefly illustrate, drawing from 10 years of experience in Social Media (even before they were called Social Media). 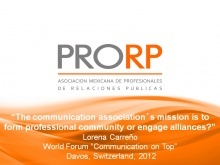 Lorena Carrenõ discusses the situation in Mexico and Latin America in terms of the public relations industry. She also discloses a bit of the State of the Art of a non-profit Association deveopled ​​alongside with due market growth. The presentation provides insight on what should do and what should be done in organized groups of professional discipline. A presentation with a sense of humour - aiming at examining the thin line between virtue and vice while following principles, values, and obligations. 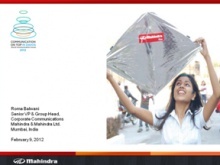 Roma Balwani, Senior Vice President, Group Head, and Corporate Communications at Mahindra Group Ltd. The presentation dicusses the advantages and drawbacks in using integrated communications as a company management strategy. 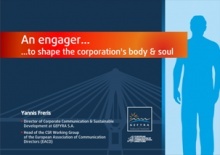 Тhe presentation offers a subtle approach to the role of the chief communications officer in making decisions and taking actions with regards to safeguarding the company reputation and image and answers the tricky question of who-is-to-blame in the case of a corporate commuication malfunction or a mistake. “Go viral” is the ambition of every advertiser, but nobody - until today - has been able to explain the real secret of virality. After his first best selling marketing book, Mirko Pallera has been looking for the “holy grail” of communication: the secret formula to design a brand and a campaign that can stimulate tons of shares in social networks. A new clear formula is born, easy and useful, to design what he calls the Viral-DNA of an idea: the genetic structure behind successful brands such as Burger King, Old Spice, T-Mobile and Nike, and behind tremendous online success, obtaining the most from investments leveraging on the great potential of social media. The presentation features "Where the hell is Matt?" (viral video) - watch it here. The presentation focuses on case studies from Barcelona and Catalonia. Juan shares first-hand experience in building a city or region image, as well as developing projects that contribute for further promotion of that image. 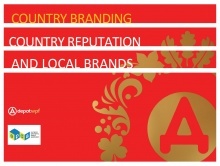 The presentations provides key strategies for successful branding and presents several cases of successful national branding. The presentation focuses on several online media strategies for the successful promotion of the city of Athens. In today's fast pacing environment of conventional, personal and social media, it is getting harder to follow what is going on globally. Millions of people are publishing, blogging, posting and tweeting, adding up to a conventional Tower-of-Babel of amazing dimensions. 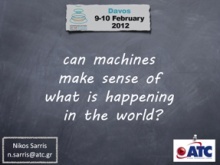 Could the existing and emerging technologies of semantic analysis help us organise this chaos of information? 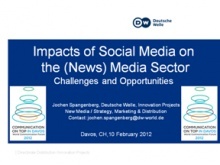 Content published in Social Networks such as Twitter, Facebook YouTube or Flickr, to name but a few, is having profound impacts on the way media organisations - and respectively journalists - are conducting their businesses and operations. 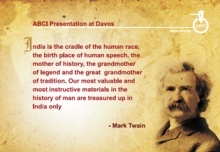 This presentation looks at some of the issues involved and portrays respective challenges of today and tomorrow. David Lee, Founder of Shakr Media Co. Ltd. The presentation explains the secrets of using semantic analysis to derive meaning from the masses of available written content, and then algorithmically visualizing it for different mediums. The presentation contains a demo video - watch it here. In mid-December, 2011, the Shakr project was given 7 out of 10 points when presented by David to experts in the popular show "This week in start-ups". The presentation offers insight and experience in financial prognosis with regards to the trading sector and explores making investment decisions and the factors that shape them. Khusid presents interesting cases from his practice as an executive dealing with investments, sharing valuable know-how and first-hand experience in start-up development. 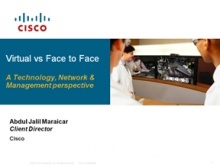 Abdul Jalil shares first-hand knowledge, experience and vision in his capacity as a top technical, sales and organizational transformation evangelist from Malaysia. Staying relevant in today’s fast-moving communications landscape – where affinity and brand loyalty are achieved with a tap of a touch screen – means being digital, multi-platform, and integrated. This casts the communications executive as visionary, experimenter, and practitioner – the one who finds the best calibration between technology and enterprise outcomes. AARP is a 38 million-member nonprofit organization that helps people 50-plus improve their lives and gain independence, choice and control. Innovations in communications technology and social media have accelerated AARP’s ability to understand, connect with, and empower the 50-plus consumer – to the point where every member has a personalized “AARP experience.” The result is that being 50-plus has been transformed. AARP is changing the way society thinks about an entire life stage by shaping a business “ecosystem” and marketplace that match up with a vital new 50-plus worldview. The presentation contains a video: watch it here. 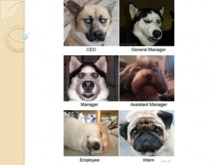 Communicators are usually blamed when the company image is low or even bad. Sometimes despite their perfect work, PR specialists cannot improve the comapny reputation. What should be done, so that reputation could become a key performance indicator also for the other departments of the company? What measuring systems should be introduced and ajusted in order to drive the company reputation upwards? 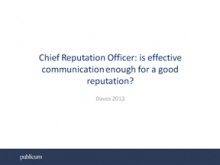 Is the position of Chief Reputation Officer a solution? The presentation features "Ice Scraper Ad" and "The Light Switch" videos: watch them here and here. How could ROM, a chocolate bar bearing the Romanian flag, gain appeal to youngsters with few national values? The strategy was to trigger a public debate about national values and thus gain favorability for ROM brand. McCann PR - Romania challenged youngsters' national Ego by replacing the Romanian flag on the package with the American one, and announcing it in the mass-media. The aim was to foster and encourage public debate triggered by this 'American take-over'. The campaign was closely monitored and public reactions were responded to. In a few days, following massive patriotic resurgence, ignited and developed especially in the social media, McCann PR brought back the old ROM, as Romanian as ever. The patriotism debate raged in the media, finally consecrating ROM as an authentic national icon which ousted the category leader Snickers and became Romanian's favourite chocolate bar. The presentation features two videos: watch them here and here. 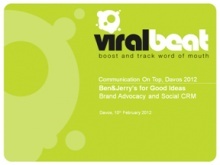 The short story of the case study goes as follows: Ben & Jerry's promoted "Good Ideas" to generate advocacy before Italian distribution kick-off. "Good Ideas" is a micro-finance program created to sustain social projects by the mean of a .000 donation to find ideas that can make the world a better place. Viralbeat activated the campaign through all social media platforms triggering a quick and huge viral response. The presentation featured a video: watch it here. 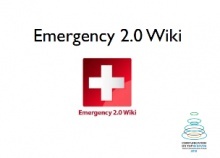 The Emergency Wiki project focuses on the network channels as a vehicle uniting the work of volunteers from across the globe. The project is a free resource available to all internet users through the ongoing input of professionals across varous industry sectors. This new collaborative model aims to facilitate global sharing and advancing knowledge on utilising web2.0 and social media particularly in emergency management.